Subluxation refers to a spinal bone (vertebra) that is not in its right position or not moving in its normal range of motion. Misaligned vertebrae irritate nerves and blood vessels, which in turn affects the way your body communicates with your spine. Subluxations cause many pains and dysfunctions in muscles and organs. The body’s natural ability to heal itself is greatly improved with the subluxation removed. Most chiropractic adjustments are not only painless; they actually feel great and relieving. In cases of a recent injury, inflamed tissue may react to adjustments and cause some discomfort. Application of ice after treatment may soothe any irritation. Most chiropractic adjustments are not only painless, they actually feel great and relieving, In cases of a recent injury, inflamed tissue may react to adjustments and cause some discomfort. Application of ice after treatment may soothe any irritation. The sound is no reason to be concerned. The sound is not coming from the bones themselves, but comes from a lubricant called synovial fluid that's found in every joint. That fluid contains dissolved gases. During the adjustment, the joints are slightly separated to move into proper position. This releases the built-up pressure on the fluid and gasses and creates a “pop” similar to the release of pressure when the cork comes off a bottle of champagne. Not all patients “pop”, and not all adjusting techniques produce the noise, which means an adjustment can be proper and effective, even if you do not hear any noise. 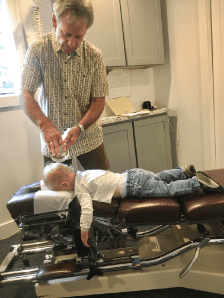 There is no age excluded from chiropractic care. Even babies can have subluxations, due to the rigors of birth. In Denmark, for example, chiropractic doctors are part of the birthing team. Children's subluxations should be treated early, as they interfere with nerves that control developing muscles and organs. Abnormal stresses on a rapidly developing spine and other bones and joints can cause them to develop abnormally. Your chiropractor can detect these problems while they're easy to correct. Chiropractors believe in the body’s ability to heal itself and for that reason, they don't prescribe medication or perform invasive procedures. They focus on providing your body with the right elements for self-restoration by restoring free-flowing communication between all parts of your body.